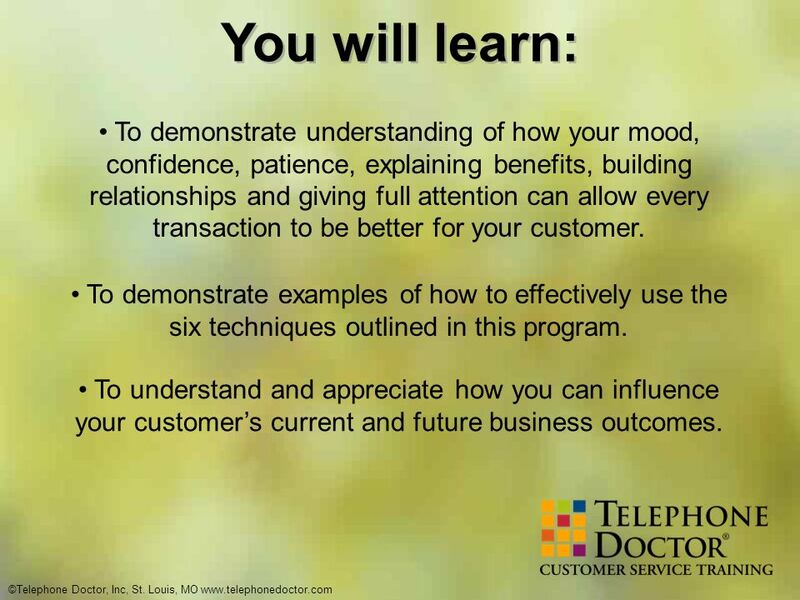 2 You will learn: To demonstrate understanding of how your mood, confidence, patience, explaining benefits, building relationships and giving full attention can allow every transaction to be better for your customer. To demonstrate examples of how to effectively use the six techniques outlined in this program. To understand and appreciate how you can influence your customer’s current and future business outcomes. 6 What is the purpose of this program? To show how a business friendly attitude can positively influence each interaction with your customers. To illustrate six common practices that will help you effect and influence the interaction. 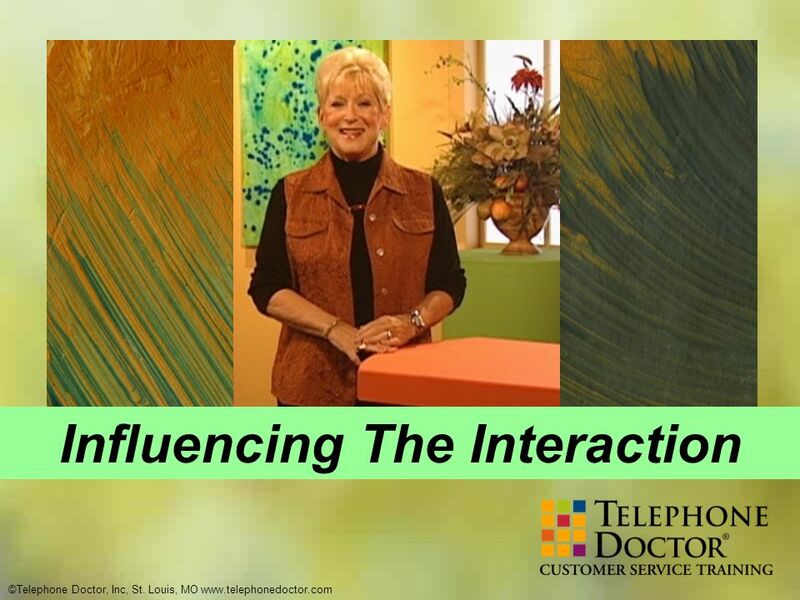 How can you influence the outcome of every customer interaction and how is this accomplished? We want you to be aware of the fact that you can positively influence every transaction. Your mood, confidence and enthusiasm have a major positive effect on every customer. 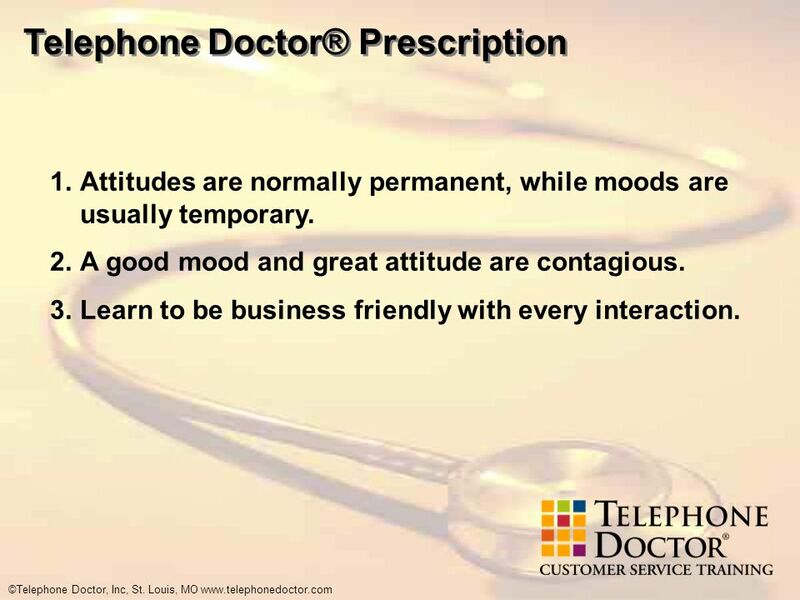 You can transfer a more positive experience to your customer by being proactive and developing a business friendly attitude. You influence the interaction through your mood, enthusiasm, confidence and attitude. You also can influence the interaction by taking time to translate benefits to your customer, showing patience and establishing a business friendly approach. What are the key points to be discussed today? The importance of your mood, attitude and enthusiasm. The importance of your confidence. The importance of patience, tolerance and understanding. 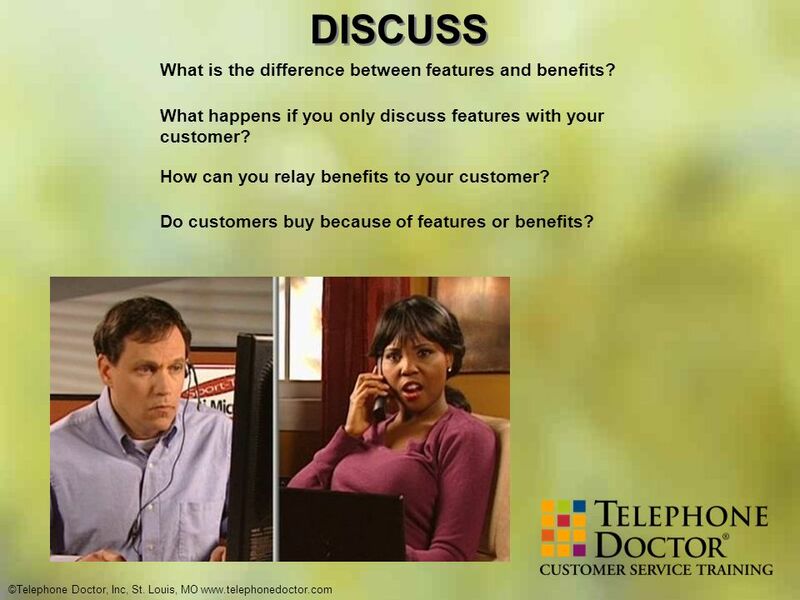 The importance of explaining benefits to the customer. The importance of establishing a business friendly relationship instead of a cold, anonymous interaction. The importance of giving your customer your full attention throughout the interaction. 7 How you influence the interaction with your MOOD. 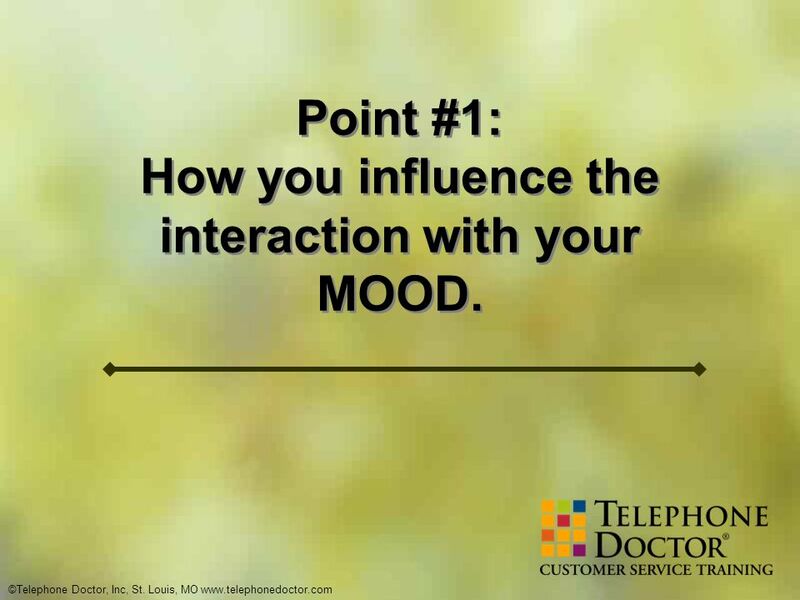 Point #1: How you influence the interaction with your MOOD. 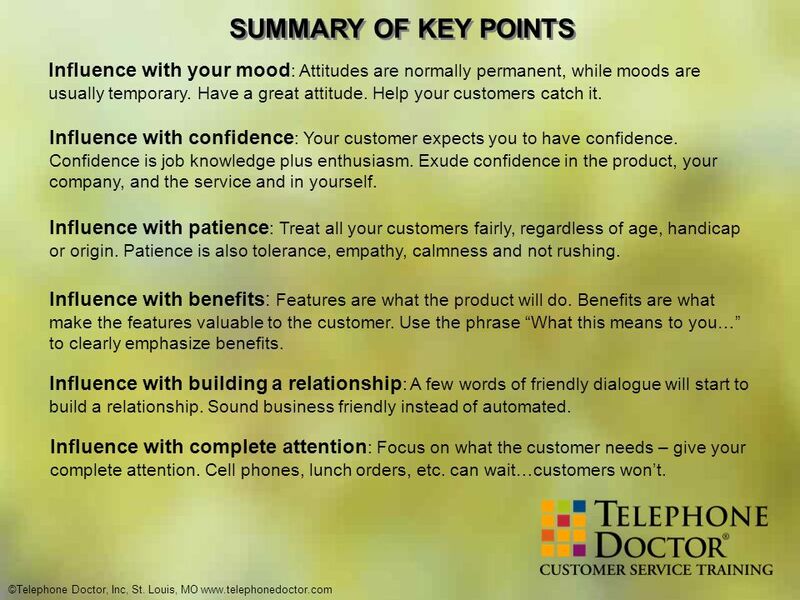 8 DISCUSS Why is your mood important to your customer? Is it possible to have a great attitude and be in a bad mood? 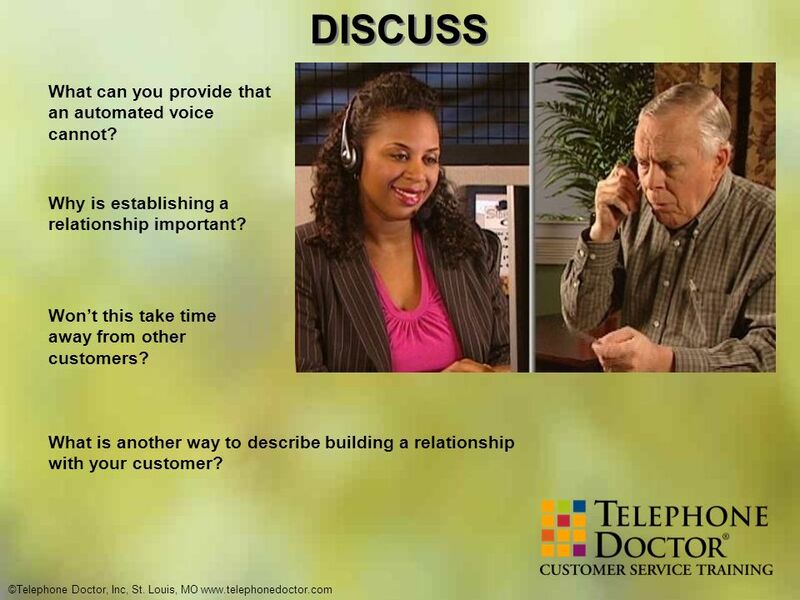 How do proactive customer service providers transfer important, intangible traits to a customer? 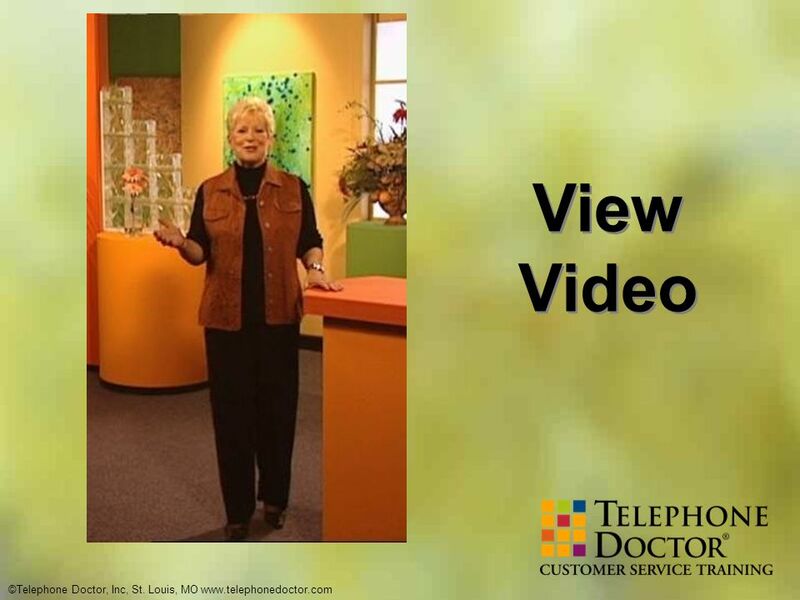 Wouldn’t you rather work with happy customers? How can you learn to consistently deliver excellent customer service? Attitudes are normally permanent, while moods are usually temporary. A good mood and great attitude are contagious. Learn to be business friendly with every interaction. 10 How do you influence with your CONFIDENCE? 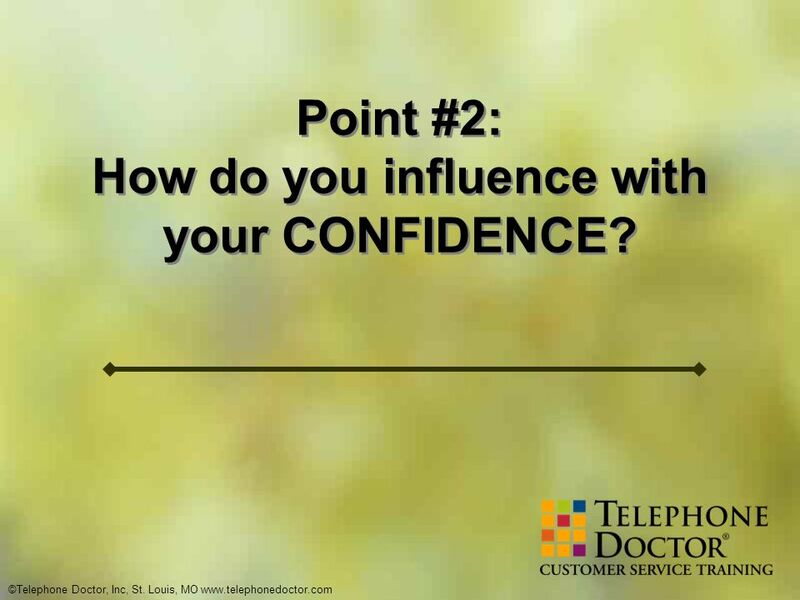 Point #2: How do you influence with your CONFIDENCE? 11 DISCUSS What does your customer expect you to be confident about? What does confidence show your customer? What does lack of confidence do? 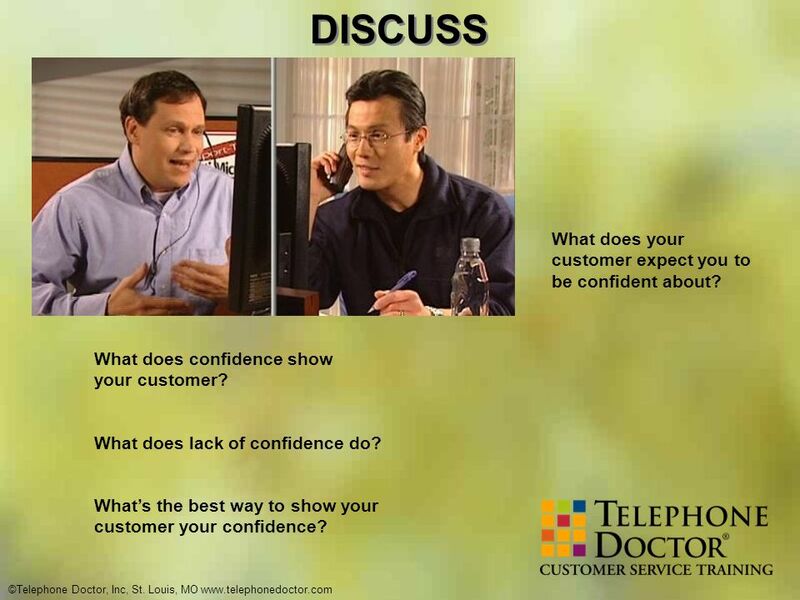 What’s the best way to show your customer your confidence? Your customer expects you to have confidence. 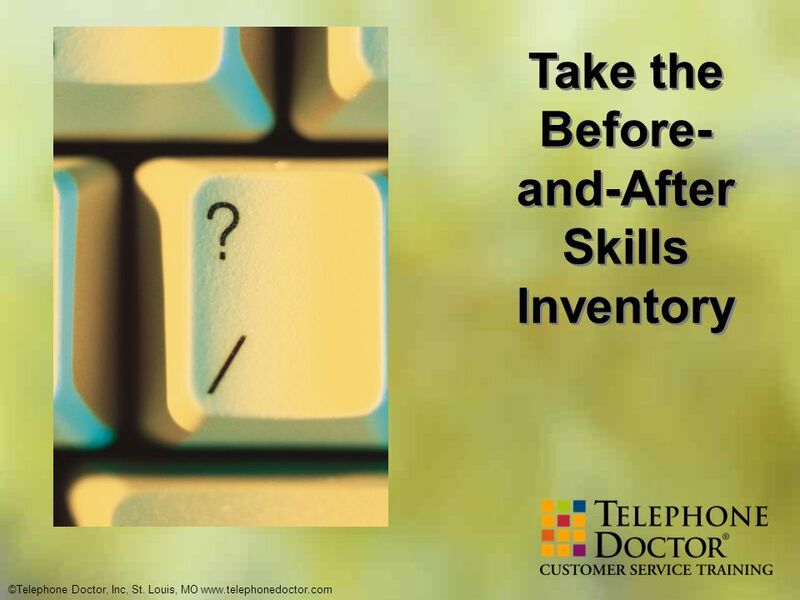 Job knowledge and enthusiasm can build confidence. Exude confidence in your products, your company, your services and in yourself. 13 How you influence with your PATIENCE. 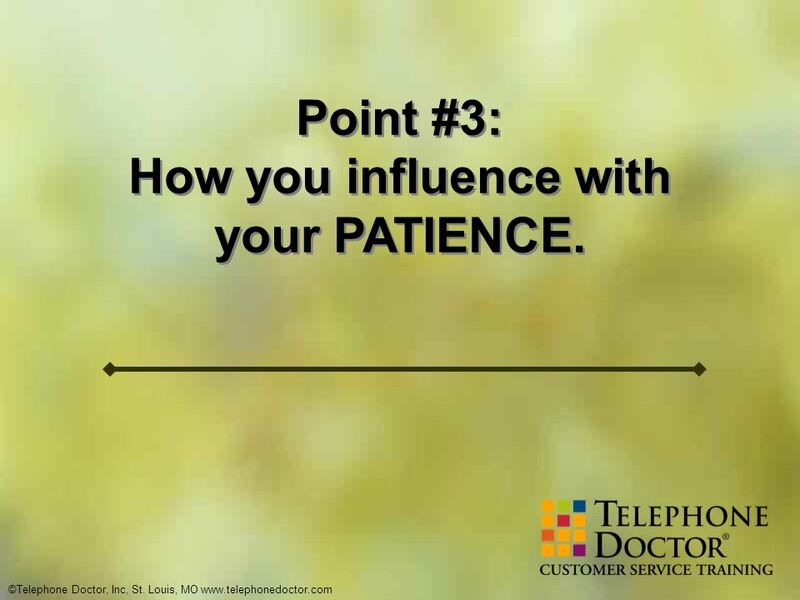 Point #3: How you influence with your PATIENCE. 14 DISCUSS What’s more important, patience or call times? What are some other words for patience? 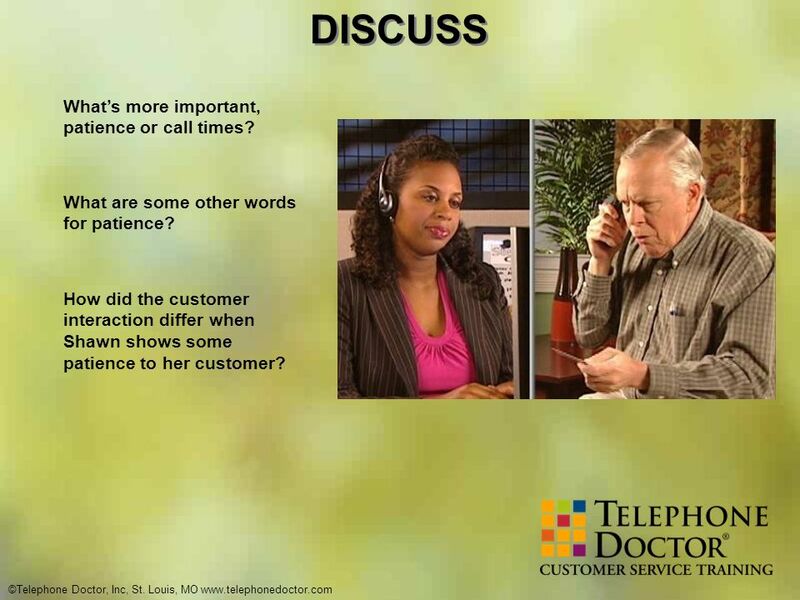 How did the customer interaction differ when Shawn shows some patience to her customer? Treat all your customers fairly, regardless of age, handicap or origin. Remember to use patience, tolerance, empathy, calmness and not rushing. Remember to apply the Golden Rule. 16 How you influence by showing BENEFITS. 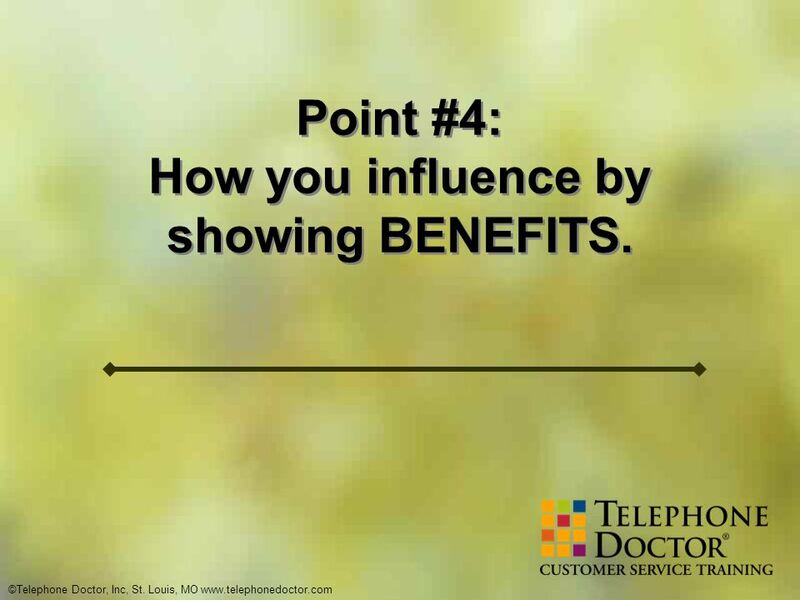 Point #4: How you influence by showing BENEFITS. 17 DISCUSS What is the difference between features and benefits? What happens if you only discuss features with your customer? How can you relay benefits to your customer? Do customers buy because of features or benefits? Features are what the product will do. 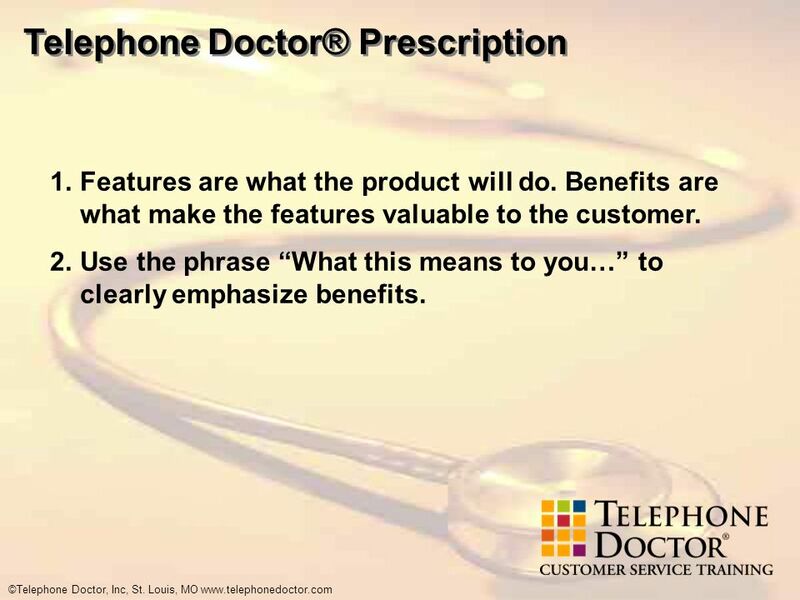 Benefits are what make the features valuable to the customer. Use the phrase “What this means to you…” to clearly emphasize benefits. 19 How you influence by BUILDING A RELATIONSHIP. 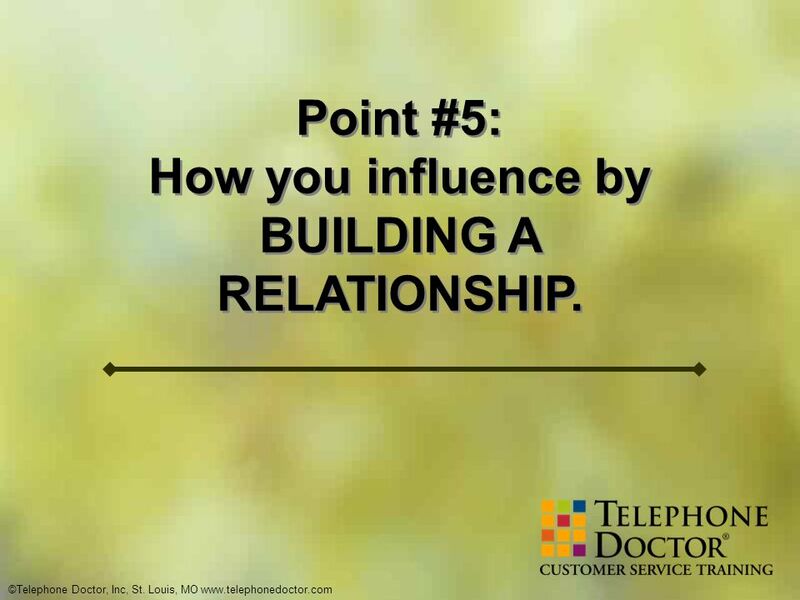 Point #5: How you influence by BUILDING A RELATIONSHIP. 20 DISCUSS What can you provide that an automated voice cannot? Why is establishing a relationship important? Won’t this take time away from other customers? 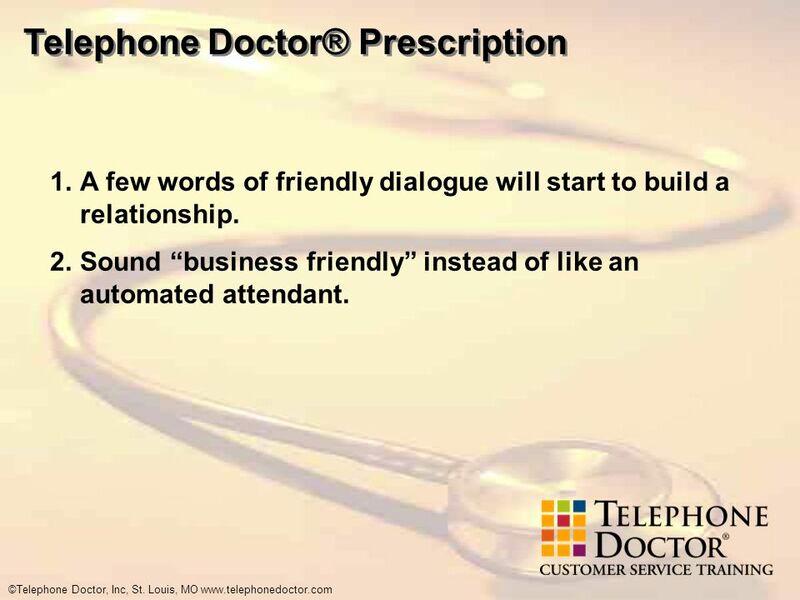 What is another way to describe building a relationship with your customer? A few words of friendly dialogue will start to build a relationship. Sound “business friendly” instead of like an automated attendant. 22 How you influence by giving your customer YOUR COMPLETE ATTENTION. 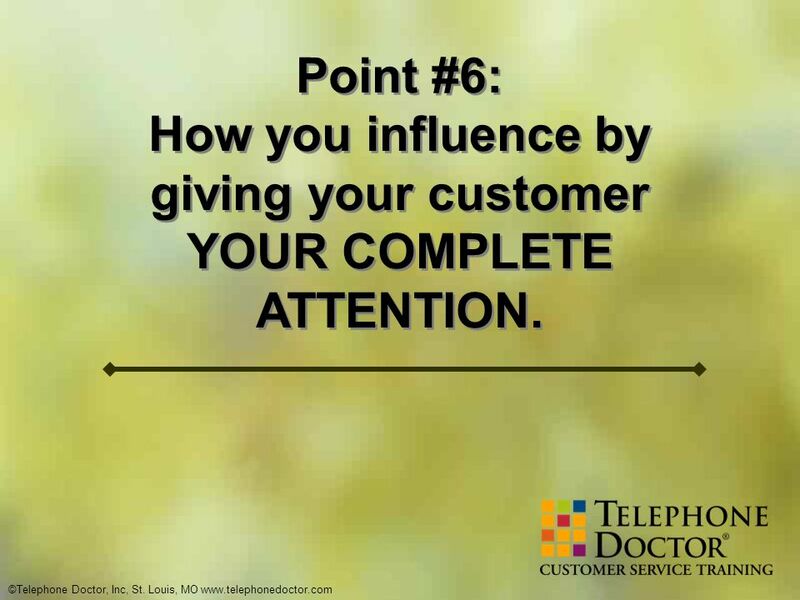 Point #6: How you influence by giving your customer YOUR COMPLETE ATTENTION. 23 DISCUSS What are some distractions in your workplace? What happens when you don’t give your customer 100% of your attention? How do you handle interruptions by co-workers? 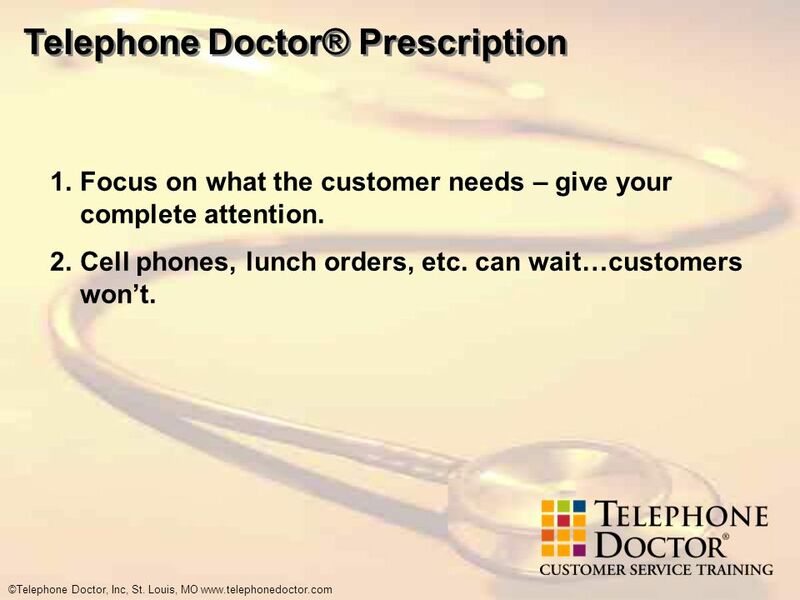 Focus on what the customer needs – give your complete attention. Cell phones, lunch orders, etc. can wait…customers won’t. 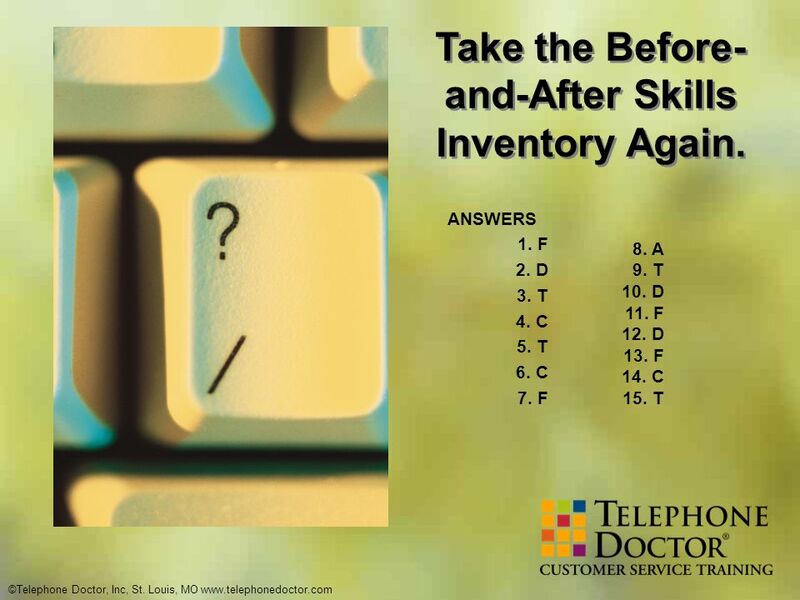 25 Take the Before-and-After Skills Inventory Again. 26 A CALL TO ACTION! 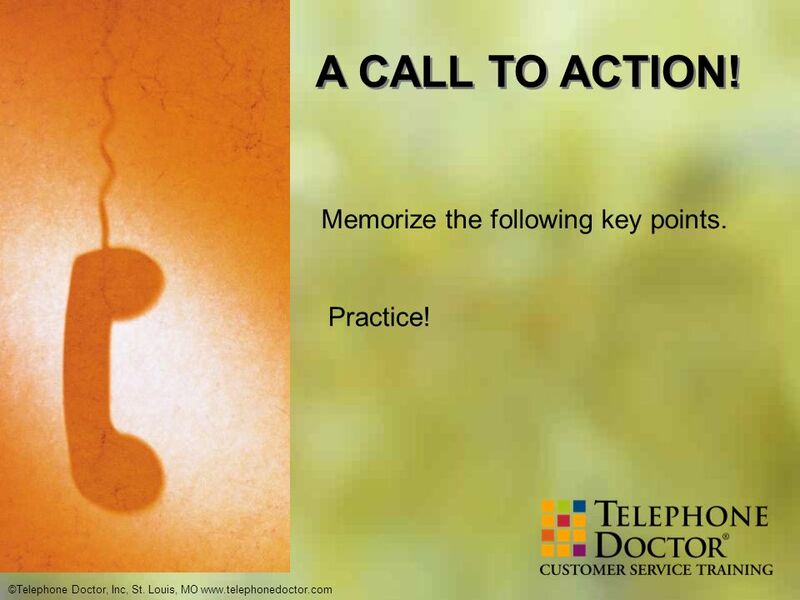 Memorize the following key points. Practice! 27 SUMMARY OF KEY POINTS Influence with your mood: Attitudes are normally permanent, while moods are usually temporary. Have a great attitude. Help your customers catch it. 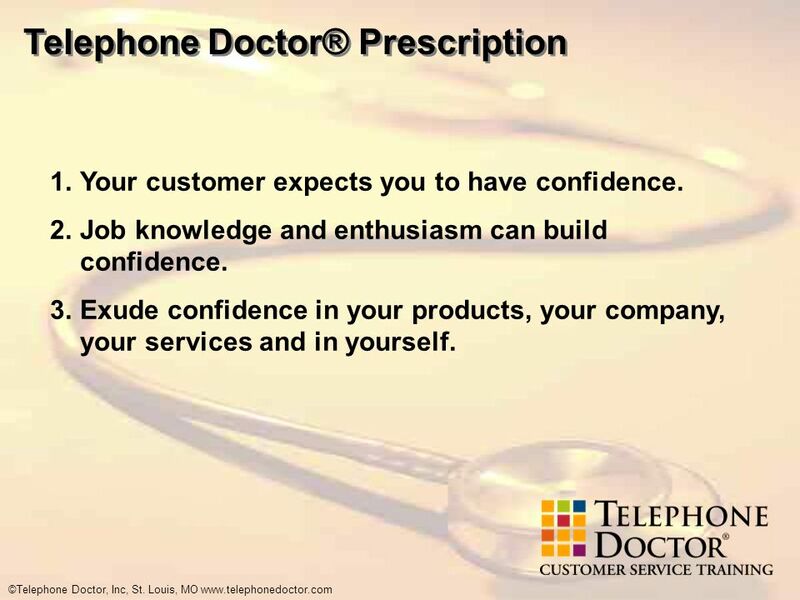 Influence with confidence: Your customer expects you to have confidence. Confidence is job knowledge plus enthusiasm. Exude confidence in the product, your company, and the service and in yourself. 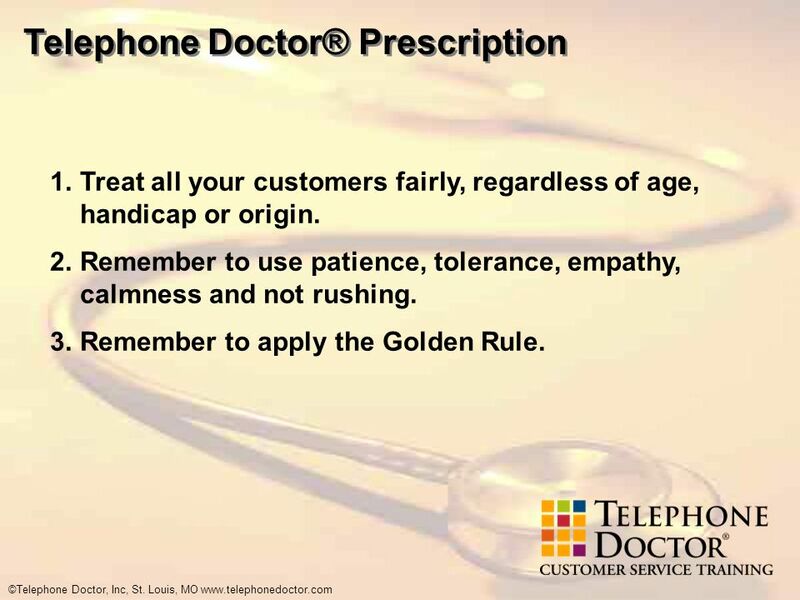 Influence with patience: Treat all your customers fairly, regardless of age, handicap or origin. Patience is also tolerance, empathy, calmness and not rushing. Influence with benefits: Features are what the product will do. Benefits are what make the features valuable to the customer. Use the phrase “What this means to you…” to clearly emphasize benefits. Influence with building a relationship: A few words of friendly dialogue will start to build a relationship. Sound business friendly instead of automated. Influence with complete attention: Focus on what the customer needs – give your complete attention. Cell phones, lunch orders, etc. can wait…customers won’t. Download ppt "Influencing The Interaction"
Change Proposal: When to Use It Use this format when you are suggesting a change. If your audience will consider it an unpleasant change, you may want. STANDARD-3.2 & 3.3 Customer Service. Satisfied –vs- Dissatisfied Customer. This unit is to prepare you for employment in sales.